In this answer I link to the Phys.org article Researcher sets eyes on Saturn's largest moon which describes the Dragonfly project, a way to explore extended areas of Titan's surface difficult to probe from orbit optically (except in infrared) by using robotic quadcopters near the surface. Electrical energy is produced continuously via RTG, stored in batteries where it can be used at higher power during flight. With solar power unavailable because of both Titan's distance from the sun and its dense atmosphere, Dragonfly would be plutonium-powered, using a Multi-Mission Radioisotope Thermoelectric Generator. That is the same power source as the Mars Curiosity rover and the Cassini space probe. It could fly several kilometres on a single 'Titan overnight' charge and potentially cover hundreds of kilometres during a Titan day (equivalent to 16 Earth days). With a surface gravity only 14% that of Earth's and an estimated density of 4 to 5x greater than that of Earth's (nitrogen 1.5 bar 90 K) it's probably the most quadcopter friendly solar system body for surface exploration, at least in terms of energy. Is the RTG part of the copter, or on a static base station that the copter has to return to to recharge? According to Wikipedia's Multi-mission radioisotope thermoelectric generator; Design and specifications the mass is 45 kg and beginning of life electrical power is about 2,800 125 Watts. 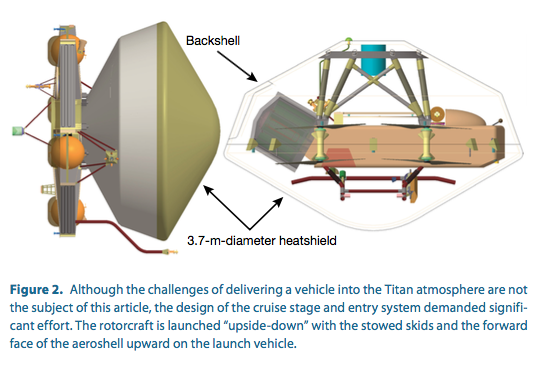 I am not sure if they plan on using a full-size "COTS MMRTG" or something scaled down, but considering Titan's unique atmospheric conditions it certainly seems at least plausible to keep it on the flier, and the thermal output would certainly come in handy. The RTG will be part of the helicopter. The helicopter will weigh 420 kg (early estimate). Dragonfly will be a helicopter-only mission, there's no ground station. This is the landing configuration, you can see the helicopter is the only object inside the aeroshell, i.e. the only object that will land. Not the answer you're looking for? 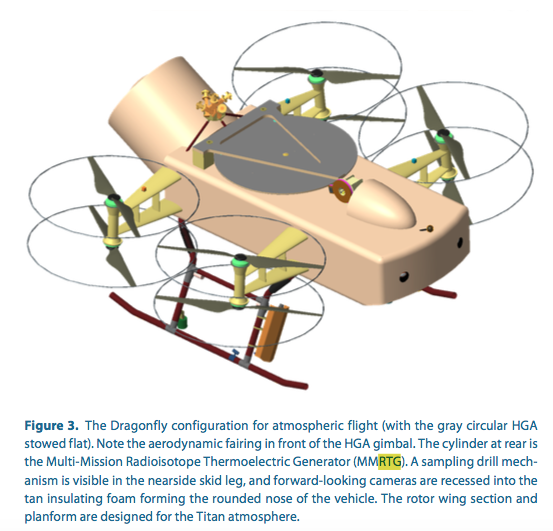 Browse other questions tagged rovers lander titan rtg helicopter or ask your own question. Why are planetary probe RTGs tilted at a jaunty angle? Could radiated heat propel space-craft in outer space? Does Curiosity pose a radiation hazard for would be colonists? Is Titan still the best bet for Extra-Terrestrial life?